Prime is a 75% Superwash Merino and 25% Nylon blend. It is a soft and squishy yarn. My variegated twist yarn, if used on socks, creates a pattern that is unique to the knitter. 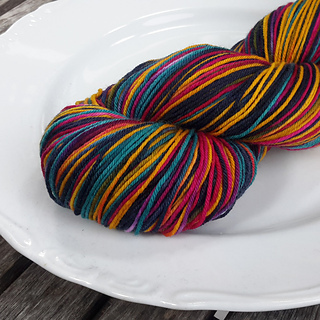 Depending on the number of stitches you cast on and the gauge you have you can get anything from pooling colors that zig, zag, and lazily coil to uniform stripes of color that spiral around the sock. Of course a very large gauge and/or stitch count will not have the same effect, but the colors will act as a traditional variegated yarn.